Description: Discworld’s only demonology hacker, Eric, is about to make life very difficult for the rest of Ankh-Morpork’s denizens. This would-be Faust is very bad…at his work, that is. All he wants is to fulfill three little wishes:to live forever, to be master of the universe, and to have a stylin’ hot babe. But Eric isn’t even good at getting his own way. Instead of a powerful demon, he conjures, well, Rincewind, a wizard whose incompetence is matched only by Eric’s. And as if that wasn’t bad enough, that lovable travel accessory the Luggage has arrived, too. Accompanied by his best friends, there’s only one thing Eric wishes now — that he’d never been born! Even the best authors have off-days. Before I read this book I thought that Terry Pratchett can do no wrong. Unfortunately I then read this book. Coming into this I knew that the Rincewind books were my least favorite of Pratchett’s material. Not only is this a Rincewind book, but it’s a particularly bad one at that. I made it to page 50 before I quit. 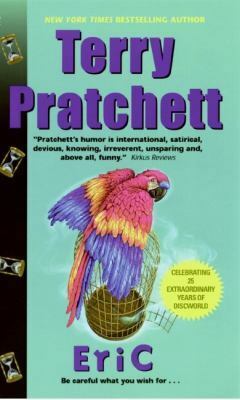 I usually find Pratchett’s humor to enlighten and enliven the plot and characters within, to bring an indefinable joie de vivre to the prose and the pacing. Unfortunately the jokes in this book fell flat. You can’t please everyone with a particular joke, and in my case some of the jokes put me off the book as a whole. That’s what happened with me. This one book didn’t spoil the entire Diskworld for me. I’ve read about two thirds of the series thus far, and plan on finishing the series eventually. Hopefully I won’t stumble across another of his books which I similarly dislike.